FORT WORTH, TX, October 08, 2018 — No one knows where love locks originated. Always reliable Wikipedia credits Serbian lovers in the resort town of Vernjacka Banja as being the first to place locks on a bridge that was the meeting place of a pair of noted lovers. No matter where the tradition originated, some people hate it. In some places, love locks have been the target of religious ire. In September of 2013, in Algeria, a local Imam decried love locks. A few of the faithful removed all of them from a bridge in Telemly a few nights later. In 2015, Parisian planners removed 45 tons of love locks from the ironwork of Pont des Arts. They did it because the weight of the locks threatened the integrity of the decades-old iron bridge. Two Americans in Paris were so upset by the proliferation of the love tokens that they started a love without lockstm website (nolovelocks.com) in true you-kids-get-off-my-lawn spirit. Not everyone shares their anti-love lock sentiment. “Love is beautiful and so are love tokens,” said Real Estate Developer Ron Sturgeon. “Maybe bridges aren't ideal places for them, but there should be a public space where love locks can be shared,” he added. In Fort Worth, TX's newest design district, love locks are welcome. In fact, in the Snap and Share Art Walk, love locks have a special mural dedicated to them. 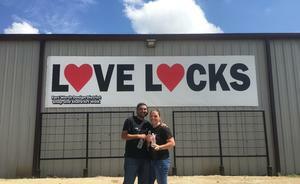 “Lovers of all ages are welcome to come and add a lock to the Love Locks mural,” said Sturgeon, President of RDS Real Estate, the creator of the 40-acre district. “We're glad to make room for the magic that comes from being in love,” said Sturgeon. The Fort Worth Design District's grand opening is November 11. Come and enjoy the new dog park and take in the Snap and Share Art Walk. Bring your loved one and pose for pictures and add your love lock to the love locks mural. Located in North Fort Worth, The Fort Worth Design District is a 40-acre enclave designed to appeal to entrepreneurs, creatives, and makers. The district includes the Snap and Share Art Walk, a dog park and three business centers: Box Office Warehouse Suites, Paddock Place Office Suites, and Golden Triangle Business Park.